One of the best things (in my humble opinion) about a good long spell of warm weather is the opportunity to eat outside without having to put on 5 layers of clothing! If you’re happy to plonk a chair on the lawn and balance a plate on your knee, that’s fine. But if you really want to make the most of your outside space and create a perfect spot for dining outside and entertaining friends and family, there are number of things to consider. 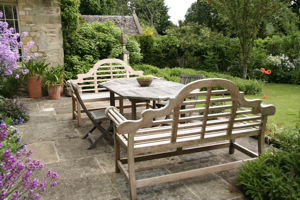 Very often the terrace is built right next to the house – and that’s great if you have a south or west-facing garden for example and love the midday and evening sun. But what if you like to eat your breakfast in the early morning sun? Or your garden faces north so your patio is always in shade? Not so great! In an ideal world we’d all have gardens large enough to give us scope for dining areas in different parts of the garden, to enjoy morning, noon or night. In reality though that isn’t often the case, so if you have to make a choice, just think about what time of the day you prefer to eat outside, and if it’s after a hard day at work for example, then position your dining area where it will catch the evening sun and you’ll get most benefit. Do take into account how far that might be from the kitchen though, because the reality is that if it’s at the end of a long garden you may not be so tempted to carry your lunch or dinner out there very often. If you’re a sun worshipper then you’re going to want to be out in the sunshine as much as possible, but sometimes (yes, even in the UK) it can get unbearably hot in the middle of the day, so think about leaving enough space for a parasol, or cover part of your terrace with a structure for shade. 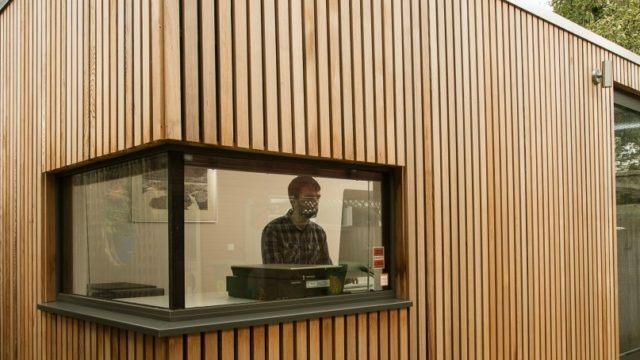 A spot next to a building is often ideal, as the heat will radiate out from the walls which is a real bonus on cool evenings, but on hot days it could become uncomfortable. If you’re creating your dining area from scratch and want to incorporate shade then think carefully about building in the structure at the start. 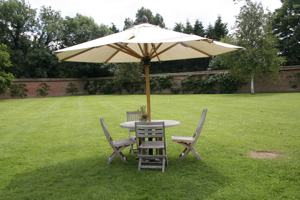 A fairly new and welcome trend is the use of shade sails in the garden, but these need serious consideration as you have to position them to create shade in the right place. They require quite hefty foundations around the base of the poles which the sails are attached to, and fixing canopies to the walls of buildings should be approached with caution as there is potential for structural damage in high winds – so just make sure you know what’s involved. An awning is another alternative. 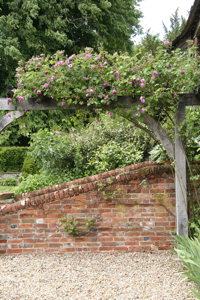 Pergolas are ideal as you can then plant a variety of climbers to grow over them which will create shade. 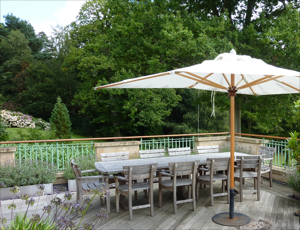 Parasols have been around forever, but it’s now possible to buy large cantilevered parasols which can be wheeled into position, so they make a great, flexible option for creating shade. So often when I go to meet new clients who are living in newly built houses, the ‘patio’ is pitifully small – and in most cases not even big enough to fit an average-sized table and chairs. So measure out your furniture and bear in mind you should ideally have 1 metre of space around the table to be able to pull out chairs and move around. And of course if you love a party, you will want a bit of extra space for when your friends come round. If you don’t have an enormous amount of room to play with, walls at seat level and built-in bench seats are a great space-saving solution. Factor in space for barbecues and any other garden or cooking accessories you may want to include too. 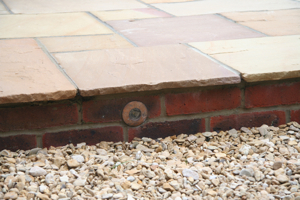 The choice of paving materials on the market can be bewildering, but as with paving in any part of the garden, think about whether the material you want to use will be slippery after rain. Consider too whether the surface will be flat and smooth enough so that your dining table won’t be constantly rocking while you eat (very annoying!). Gravel is a great landscaping material in many respects (cost-effective, easy to lay, drains well) but it’s not brilliant if you’re pulling chairs back or moving furniture around on a regular basis. Decking is wonderful when it’s dry, but lethal when it’s not! 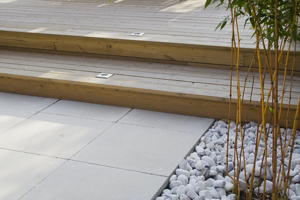 As an alternative, you could consider recycled decking which is slip-proof when wet. I don’t know about you, but I feel distinctly uncomfortable eating (or even just sitting) in the middle of an open space, or in view of neighbours (who probably aren’t in the least bit interested in watching me, but that doesn’t really help!). I think most of us feel much more comfortable sitting in a cosy, protected corner, and not feeling overlooked. The obvious way to achieve this is to create a dining space with some sort of sense of enclosure – whether it’s against a building or wall looking out over the garden, or just surrounded by planting that’s high enough to create an intimate cosy space. (See below for planting ideas). If you’re overlooked by neighbours, you might be able to plant trees or large shrubs to block their view. Make sure that whatever tree you plant won’t get too big though as you want to make sure that the crown of the tree is in the right position for screening, and it doesn’t get too high to be of any benefit. 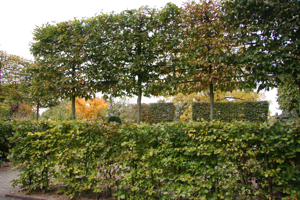 A very useful screening technique is to use pleached trees which are trained to form a hedge-on-stilts type effect. Unless you’re planting evergreens, bear in mind that your trees or shrubs will only make effective screens when they’re in leaf. 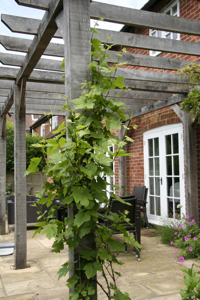 Pleached trees are an effective way to screen out your neighbours! Tall evergreen shrubs which can be clipped to keep to size can be ideal for a spot of strategic screening. Depending on your site conditions, try Pittosporum tenuifolium, Photinia ‘Red Robin’, Viburnum tinus, Prunus laurocerasus, or Elaeagnus ebbingei. Bamboo of course is a wonderful screening plant in the right situation, but it can be a thug so choose your variety carefully. Phyllostachys nigra has fantastic black stems and makes quite a statement at 3-4 metres in height, but likely many bamboos it’s a plant that likes to spread, so either grow it in a large pot or contain its spread at ground level. 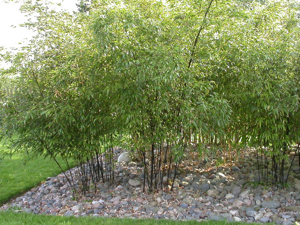 Bamboos are a great screening plant – but handle with care. A well-positioned pergola or arch might create enough of a screen (especially with plants on top) to give you the privacy you want. Scrambling climbers such as Honeysuckle, Jasmine, rambling roses or the evergreen jasmine Trachelospermum jasminoides will add extra height and bulk – and beautiful scent! If you’re not eating just outside the house, bear in mind that a route over the lawn is all well and good on a sunny summer’s day, but when the grass gets damp, it’s less appealing! 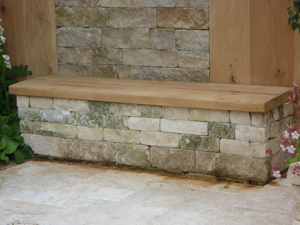 Think about building in a hard surface to lead you from the house, or even just stepping stones through the lawn. And if you are likely to use this route a lot, consider putting in garden lighting at the beginning of the landscaping process as cables can be buried underground at the same time. Make sure to light any steps or dark areas which could be dangerous at night. Dining areas aren’t just for summer! 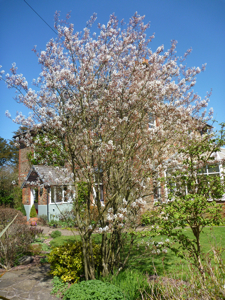 I know we have to put up with all sorts of horrible weather in the UK, but there are days in spring, autumn and winter where it’s a pleasure to be in the garden, and to enjoy just being outside. So think about how you can make your dining area more useable all year round rather than just for 4 months of the year. 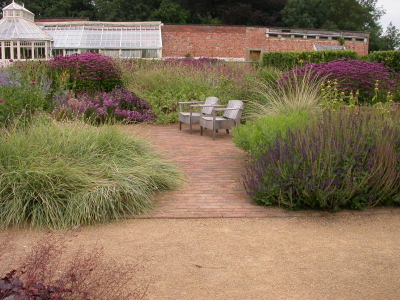 Create a sheltered space with plants and structures high enough to filter out cold wind, but ideally not to cast too much shade when winter sun and light are at a premium. 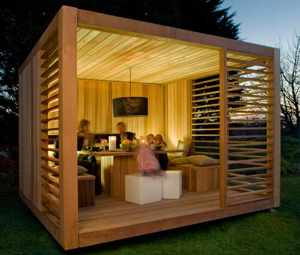 If you have room, consider building in a summerhouse or arbour so that when things get a little chilly you’ve got the option of a bit of additional shelter. 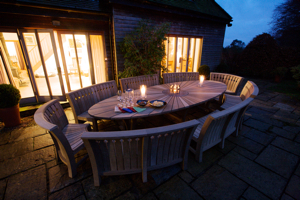 If you can incorporate heat and lighting into your garden building, then there really is no excuse not to make more of your outdoor dining area throughout the year. Don’t pack your furniture away! If you can invest in good quality furniture and leave it outside all year round, I guarantee you’ll spend more time in your garden. There is a huge range of furniture on the market from gorgeous oak, to weatherproof rattan lookalikes, so I’d say there’s something to suit every taste. The key is that if you have something lovely to look at, that can stand up to the rigours of the British climate, and that isn’t hidden away in the garage, then when the weather perks up and the fancy takes you, you can take your lunch into the garden with the minimum of hassle. Fragrant plants are of course a bonus anywhere in the garden, and they are definitely a lovely thing to have around a dining area. There are so many wonderful scented plants you could use but the main thing is to put in the right plants for your garden conditions – so you need to think about sun and shade, and what kind of soil you have (free-draining or heavy, acid or alkaline – or somewhere in between). 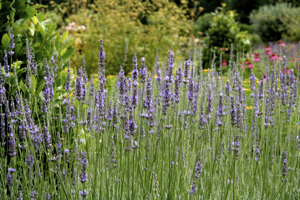 Herbs are of course fantastic for aromatic leaves (think Rosemary, Sage, Origanum, Artemesia) and Lavender is invaluable for flower and foliage. To grow successfully, they will need lots of sunshine and free-draining soil, so if your garden soil isn’t light enough you could try growing them in pots or raised beds. 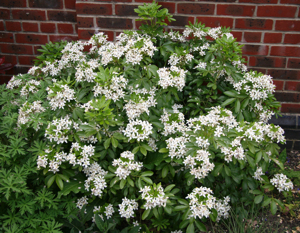 If you’re looking for scented shrubs at say, 1.5-2m in height to help create an intimate dining area, without you could consider the Mexican orange blossom (Choisya ternata), a very pretty shrubby lilac called Syringa microphylla Superba, and Viburnum carlesii Aurora which has pale pink snowball flowers in spring. Osmanthus Burkwoodii is an evergreen shrub which can also be grown against a fence or wall and has small white scented flowers in late spring. Euphorbia mellifera needs shelter but given the right conditions this gorgeous large, rounded shrubs gives off the fragrance of honey. Delicious! If you can fit in a Philadelphus anywhere, do it! They have the most beautifully fragrant flowers. Philadelphus Manteau d’hermine is a small variety (less than 1m high) which is ideal to plant next to paving, or even in a raised bed where your nose is nearer to the flowers! Bad smells as well as good should be taken into consideration too and obviously avoided where possible – cess pits, car fumes, whatever! A cliché it may be, but there’s no doubt that men love to barbecue, and I’m more often that not asked to find a space for the barbecue when I’m designing my clients’ gardens. But things are moving on in the realms of cooking and entertaining outside, so now you not only have the option of wheeling out the latest hi-tech barbecuing kit on the market, but you could opt for built-in barbecue, a built-in fireplace or a wood-fired oven. If you’re a keen cook and want a flexible option, why not go for a mobile trolley with electric induction hobs which means you can take your kitchen with you wherever you fancy (as long as you’ve got a power source nearby). 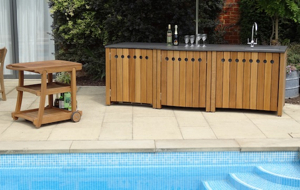 Or how about an outdoor modular kitchen with fridge and a warming drawer? Perfect for parties. 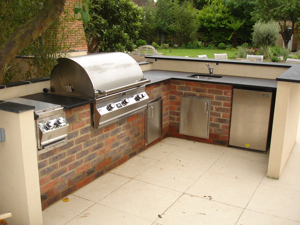 A more permanent solution to really embrace outdoor entertaining is the bespoke outdoor kitchen (grill, side burner, fridge, sink, storage…) which can be designed and built as part of your overall garden layout to make sure you really are ready to make the most of your outdoor space all year round – and whatever the weather. Then, simply add a lovely view, some comfortable furniture, the sound of running water, a dash of garden lighting and a firepit to keep things toastie, and you’re away! 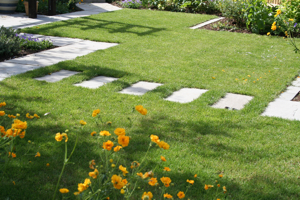 If you like the sound of making more of your garden but feel a little overwhelmed at the prospect of doing in yourself, please get in touch to talk through your project. I was recently invited on to BBC Radio Solent to talk about how to go about creating your ideal outdoor dining space. You can listen to the clip here. the built in furniture is so inspiring :)! thanks for sharing. Glad to be of service balconyman! 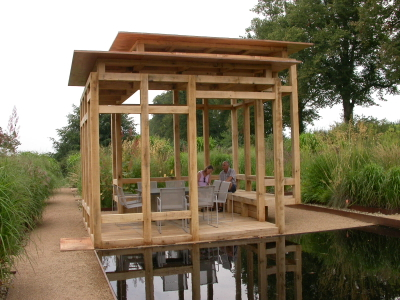 There are many ways to do it, but the photo I used is a lovely bench I saw at the Chelsea Flower Show in 2011. Simple but effective.